Hotels with special deals, packages! 4-star-hotel in the 1st district of Budapest. Address: 1013 Budapest, Krisztina krt. 41-43. The hotel has 400 rooms. Mercure Budapest Buda is located next to the South Station and the subway station, just 4 metro stops from the center. All air-conditioned rooms have satellite TV. Airport: 22 km km >> Order your transfer! 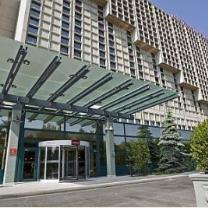 Mercure Budapest Buda has 400 rooms with air-conditioning, bath, colour TV with satellite channels, phone, minibar, magnetic card system, room service. Rooms for non-smokers and guests with allergies. PC-connection and use of hotel safe upon request. Budavár Restaurant - offering Hungarian and international dishes. The Bar offers local and international drinks and a wide range of coffee and beer specialities. Fitness and wellnes centre: indoor swimming pool, sauna, solarium, massage, whirlpool, gym. Laundry, souvenir shop, car rental. 7 rooms with a capacity of 10-250 people. All meeting rooms feature the latest audio-visual equipments. By plane: 25 kms from Ferihegy Airport. Airport Minibus Service is available. By train: Near to the South Railway Station. The East and the West Railway Stations can be reached quickly by underground M2 and M3. By car: 10 minute drive from Ml and M7 highways. By public transport: The terminus of underground M2 is within 2 minutes walk. There are tram and bus connections reaching different parts of the city. Fixed prices, pick-up service, exclusive transportation directly to your hotel, or to any address in Budapest.